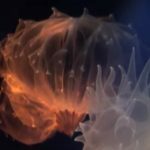 One of the more common and often more disturbing observations for many newer reef hobbyists is seeing their corals extend their mesenterial filaments. 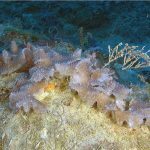 Reactions can run the gambit from fascination to horror (e.g., “What are these worms attacking my coral?”, “My corals are all losing their guts—are they doomed?”). The good news is that this is normal behavior for many species, but the reasons for the behavior are highly varied. Mesenterial filaments are string-like extensions of the mesenteries—the internal folds of tissue which create structure within a coral polyp’s body. They are typically bright white and full of nematocysts—specialized stinging cells that corals use to capture and kill prey, and to sting their competitors. Mesenterial filaments are used by some coral species to attack and digest away their nearby coral competitors, a behavior that has been well known for many decades. Perhaps the best example of this behavior typically seen in aquaria is with the beautiful but aggressive Hydnophora spp. Many species of coral in captivity also seem to extend their mesenterial filaments after certain kinds of food are added to the aquarium, but this behavior is highly variable and many corals seem to be quite picky about the stimulus that will elicit this response. Generally, this sort of behavior is not seen in nature. However, Dr. Kristin Marhaver, a postdoctoral researcher at the University of California at Merced, recently reported some very interesting observations that put a new spin on and old behavior. Writing in the journal Coral Reefs, Marhaver observed bleached Boulder Brain Coral (Colophyllia natans) and Mountainous Star Coral (Montastraea faveolata) extending their mesenterial filaments into adjacent turf algae beds link. This was only observed at night, and only among bleached corals, never among healthy ones. When corals bleach they lose a large portion of their symbiotic zooxanthellae. 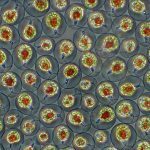 Normally zooxanthellae provide corals with significant amounts of rich, sugary food. 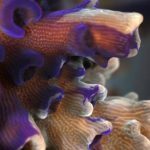 With less food coming from their zooxanthellae, bleached corals can quickly begin to starve, but some species seem capable of also increasing their use of other food sources while bleached. 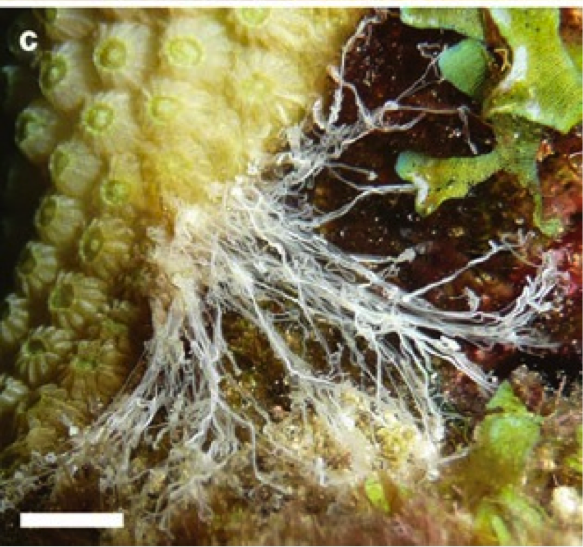 Since neither C. natans or M. faveolata are known to attack turf algae with their mesenterial filaments, and this behavior was only observed in bleached corals, Marhaver suggests that the corals were probably fishing for food! Further study is required to test this hypothesis, but it is an intriguing possibility. We know that some corals are more likely to recover from bleaching than others, but often the reasons for these differences in recovery are unclear. These observations add to a growing body of evidence that suggests that some coral species partially offset the costs of bleaching by increasing their food intake. More flexible corals may be more likely to survive bleaching events, and could help coral reefs to survive as the climate continues to warm. Interesting study. It makes a lot of sense when you think about it. I’ve seen corals use their mesenterial filaments (Hydnophora has to be the worst offender) to attack corals but I’m going to be more observant from now on. Reef Balls Are Made Out of People.